The front of the two routers are similar, they both have a few indicators for power, mode, WiFi and signal with Huawei Logo on the front. The Huawei E5186 has one more indicator for Voice. 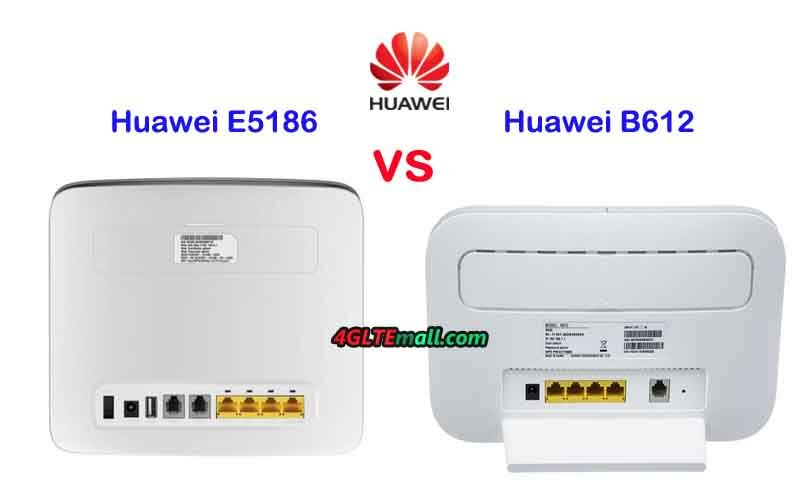 One the back, Huawei E5186 router has 3 LAN ports and one LAN/WAN port. It also has two telephone ports and one USB port, but Huawei B612 has only one telephone port and no USB port available. The Huawei B612 router has an angled backrest which makes it stand more stable. 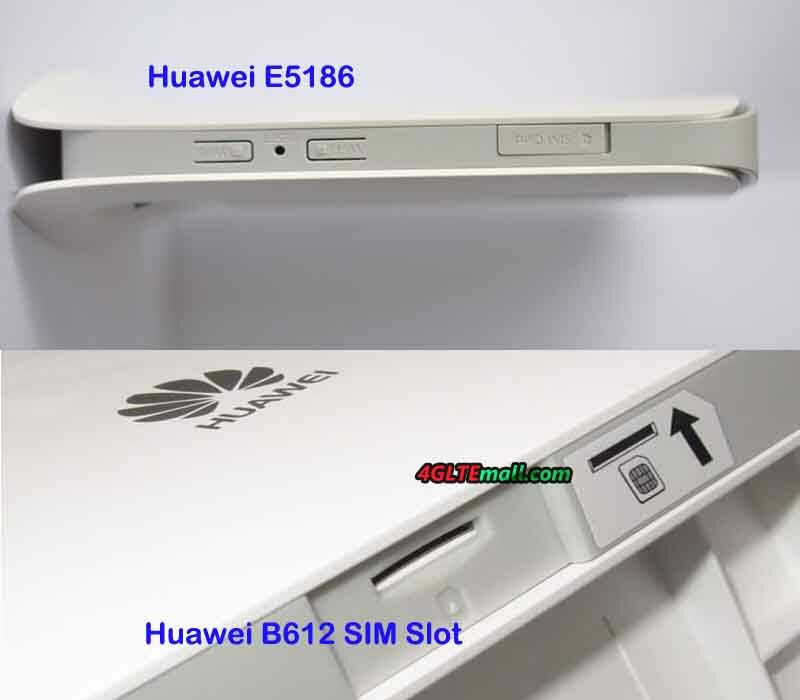 The SIM card slot of Huawei E5186 modem is at the edge side of the device while the Huawei B612 SIM card slot is at the bottom. The Huawei E5186 has the WiFi button and WPS button with the reset hole at the below side of the SIM card slot. The Huawei B612 power button is at the top side with WPS button. They both have two connectors for external antennas. The connector type is SMA and covered by a cap. One more thing we have to mention is that perhaps the Huawei B612 is the latest new model, the price is more expensive, but we suppose the Huawei B612 price would become cheaper soon. 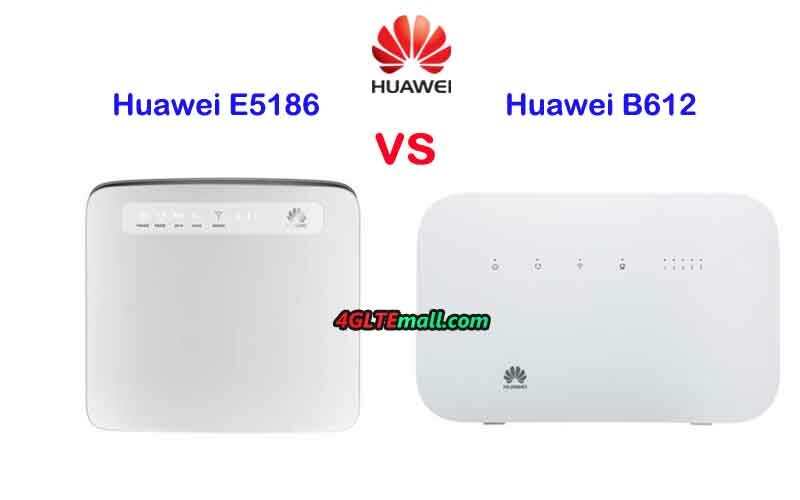 If you want to buy a 4G LTE modem router, we think the Huawei E5186 is very good to recommend based on the price/performance ratio.